Intuitive, compatible with all brands of touchscreen, and designed to simplify the use of large format presentation screens, Tango Elite provides the easy way to create, group and store media and then deliver it to your audience in a matter of seconds. Seamless and responsive navigation means that all features, from the simple drawing tool, to ‘drag and drop’ content from the web and your own resources, will present an engaging, memorable and visually stimulating presentation, time and time again. As Tango Elite was designed specifically for use with large format LED touchscreens, it means no more fiddly buttons, toolbars or menus that pop up, that would normally require the use of a stylus or pen. Simply use the screen as you would do a tablet, smart phone or any other multi-touch device to ‘pinch and grab’, ‘drag and drop’, resize, rotate and annotate. Build dynamic, interactive presentations in minutes. Tango Elite is designed to revolutionise the way interactive touch screens are used within meetings and presentations. Tango Elite will transform your touch-enabled large format display or multi-touch table into a powerful presentation tool. Use resources and media from a variety of online sources including YouTube and online images, or use locally stored resources to quickly create collections of media which can be re-opened and presented within seconds. 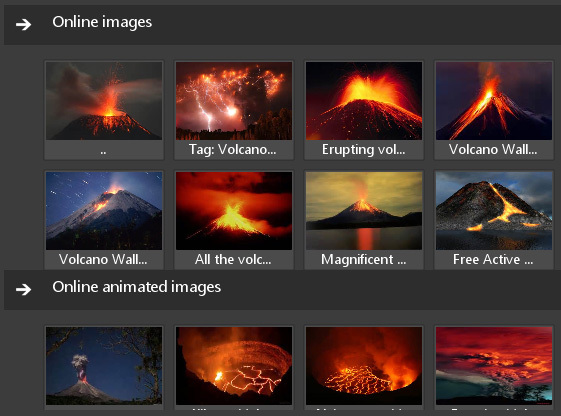 Tango Elite supports a large number of media types including pictures and photographs, videos and movies, animations, PDF files, Word Documents and Power Point presentations which can be imported in seconds. Resize, position and rotate full HD videos - even while they're playing. A single tap makes a video resize to fill the entire screen for quick, instant playback to a whole class while another tap restores it back to its original size. Work with large high resolution images and other media formats, freely positioning, cropping or resizing as you require. With no limit on the number of touch points, Tango Elite will support however many touch points your hardware supports, whether that's 2, 4, 6, 10, 32 points or even more. This means that numerous pupils and students can interact simultaneously. Students are able to collaborate by inserting, moving, scaling and rotating media objects at the same time and even use multi-touch gestures together on the same surface. You deserve more than limited content galleries and clip-art. Deliver web-based content such as YouTube videos and online images without leaving Tango and import media directly into your presentations✝. Transfer your existing resources to and from Tango from your hard disk, network shares or memory sticks. Import and export Tango Teach presentations between colleagues at the touch of a button and bring alive your new and existing back catalogue of PPT, Word doc, PDF, video and audio files. Manipulate each individually or in groups to move, resize, and reimagine to suit the needs of your meeting, not the abilities of the technology. ✝Online content search is included with subscription-based licensing. For perpetual licenses, online media search is included for the first year and you will need to purchase a support & upgrades subscription to continue to access online media search features for year 2 onwards. Easily connect mobile devices such as iPads, tablets, smartphones or even laptops and netbooks to utilise Tango's collaboration features. Broadcast the Tango Elite workspace or other applications to mobile devices ensuring your audience is engaged and presentations are inclusive. Send content from Tango to mobile devices, and push media from mobile devices straight into the Tango workspace from any connected device. Tango Elite's collaboration features are device independent and do not require any pre-installed app, although an iOS app is available for additional functionality. Designed to run on both Windows PCs and Mac OS, Tango Teach is equally at home on either platform. Perfect for use in mixed environments, presentations created in Windows can be opened on Mac, and vice-versa. Our mobile showrooms are travelling the country, bringing the technology to you and allowing you to try it out before making any purchasing decisions. 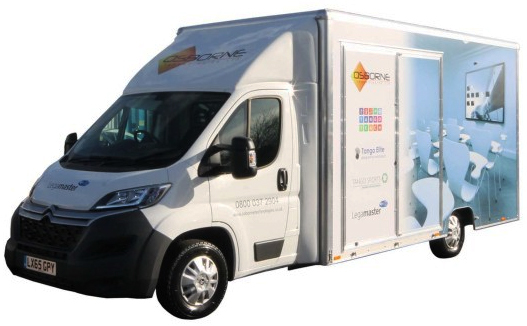 Equipped with a range of large format touchscreens in a variety of different sizes, our fully self-contained demo vehicle allows you to see, use and evaluate the technology yourself before making an investment. "Tango Teach has revolutionised the way teaching and learning are delivered within our classrooms. The ease with which the staff can grasp the new technology is astounding as Tango Teach builds upon the gestures we use every day on smartphones and tablets. The resources available through Tango Teach, as well as its ability to support numerous file formats with ease, makes this our go-to digital teaching resource."